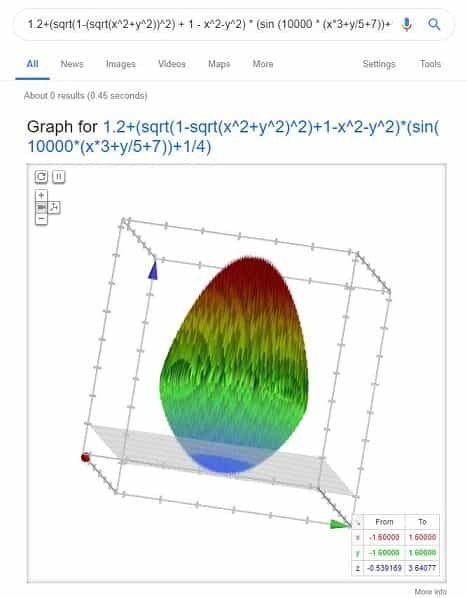 An Easter egg is an unexpected or undocumented feature in a piece of computer software, included as a joke or a bonus. – Google. Yes, there are lots of hidden tricks you can do and amaze in Google search results. 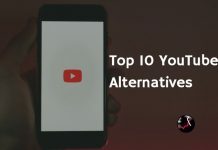 I’ve given you some list of keywords using which you can play games, do cool tricks and much more in Google search results when you are bored. Just go to google.com and start typing these words and have fun. You can also try my previous posts – Bored websites and Useless websites. Though there are a lot of websites to play games online, here are some games which you can play in Google search results page, These are the Google easter egg games. You remember that snake eating fruits in your old Nokia phones and Nintendos? 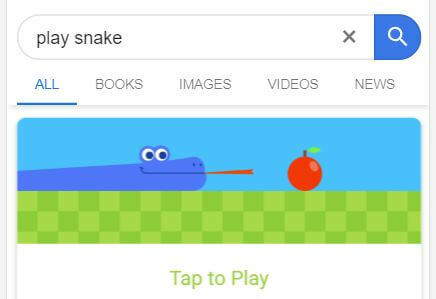 Yes, Snake game is back and now it is inside Google search results. 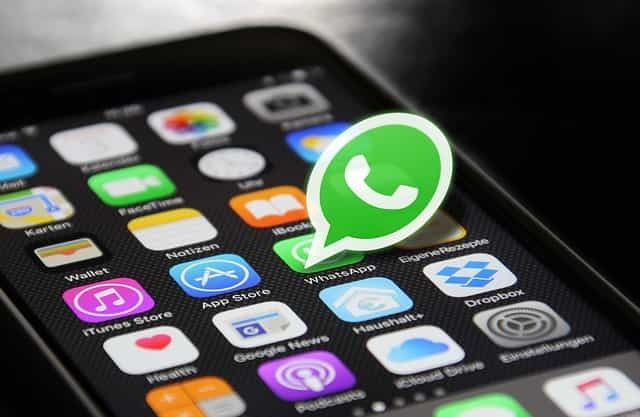 once you type Play snake and hit enter in your Phone or PC, you’ll get the snake and fruit image, now click tap to play. 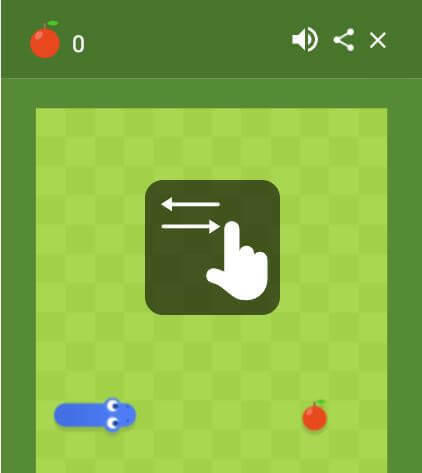 the game opens swipe left or right in your mobile to move snake and arrows in PC. collect as many fruits as you can and challenge your friends. 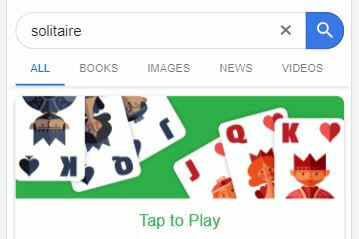 Hope Windows users miss this game, Solitaire is the cards based game which you can play now in Google search results page. 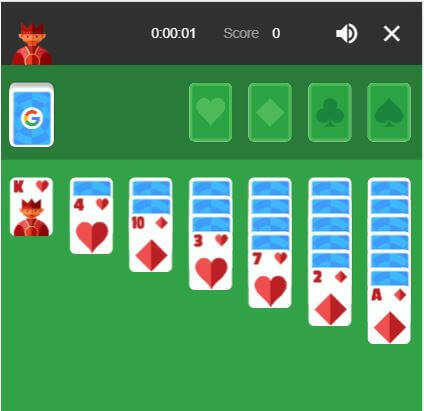 Click on Tap to Play, you’ll get the below screen, If you are new to this game, find the game rules here – Solitaire rules. 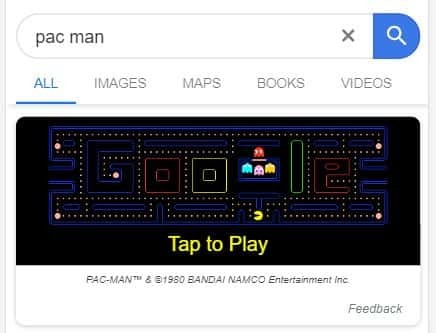 Pacman is everyone’s favorite, Searching for “Google Pacman” has a playable version of the Pacman game appear on the screen. You can swipe in your mobile and use Arrow keys in PC to run the maze and Play. 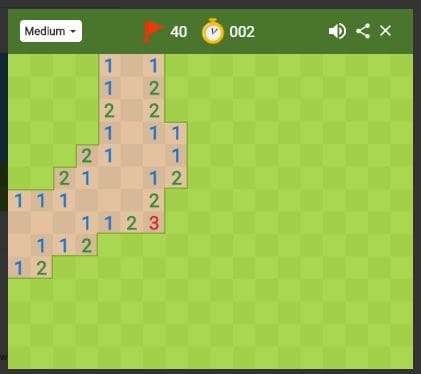 Do you Miss Minesweeper game? Google brought it to search result page and now you can play that for free. 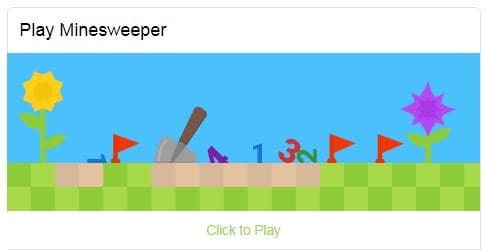 Google “Minesweeper” or “Play Minesweeper”, you’ll find the game screen in Google search results. Hit play and start playing. People who don’t know what this game is, you have to find all the land mines in this game without detonating them and you can get the help from the neighboring fields, if you find 1, then there’s a mine in any of the 8 fields surrounded by that 1. right click to mark a Flag. 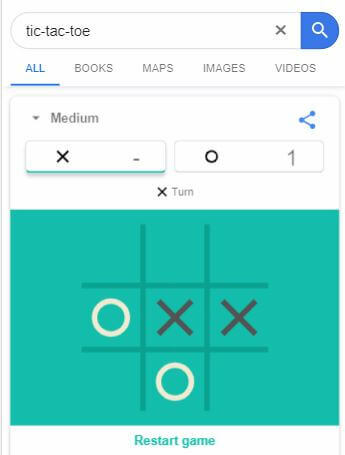 Yes this game is also there in Google search, by default game will be in Medium mode, and you’ll be playing this game with Google, you can change the difficulty level and play with your friends by changing the option at the top right. You can start playing this game by typing “Zerg Rush“, but it is hard to play in mobile, you have to go to setting and enable desktop site. Type “Zerg Rush”, series of ‘O’ starts attacking your search results, you have to click on them thrice to kill each ‘O’, the game becomes very hard when the number of Os increases. 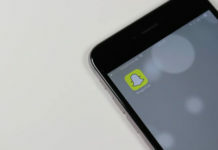 Try this and update your score in comments. Try this in Desktop, for mobile enable desktop site. 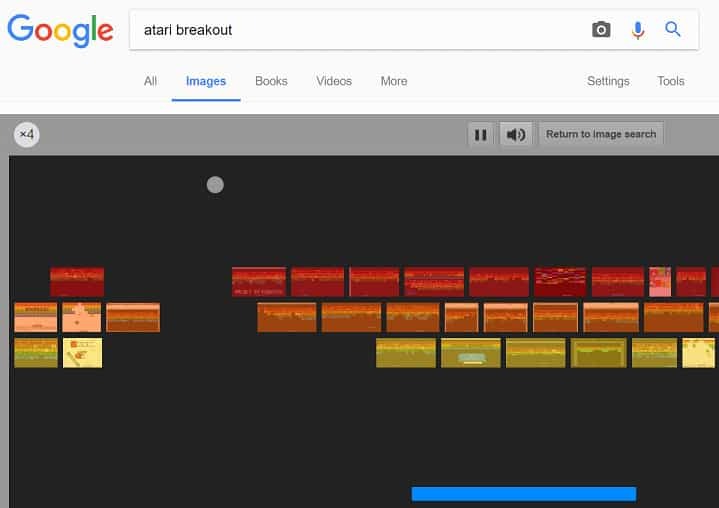 Search for “Atari Breakout” and click on images just below the search bar. Will start a ball game by combining all the images. Just by answering 6 questions you can find which animal are you. Curious? 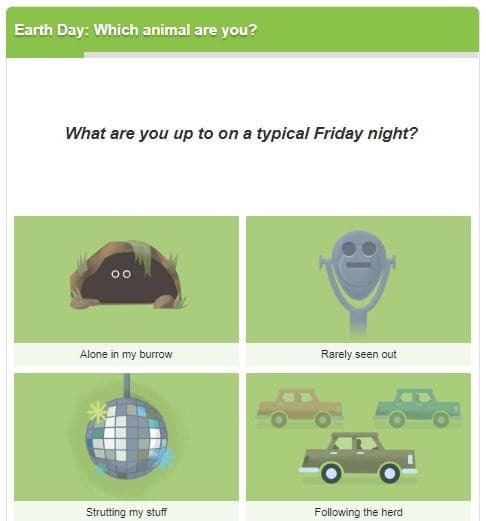 just google “Earth Day Quiz” and start answering. Dreidel is a Top with four sides, Nun – nothing, Hei – half, Gimel – all, Shin – put in. 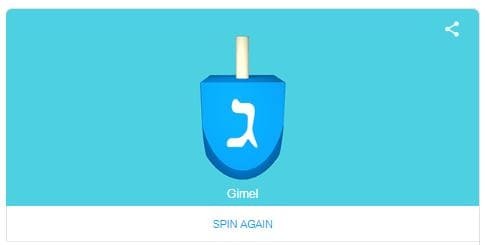 Google “Spin a dreidel” to get this spinner and Click spin to start spinning. Now, listen to the Animal sounds in Google Search results, this Google easter will be so much fun for kids, Just Google “Animal sounds” and you can see a list of animals, tap them to see what that says. Click see more and find nearly 57 animals in the list. Here are some mind-blowing Google search tricks you can do and impress your friends. Same like games, just type the keywords in Google search and you’ll see the tricks working. 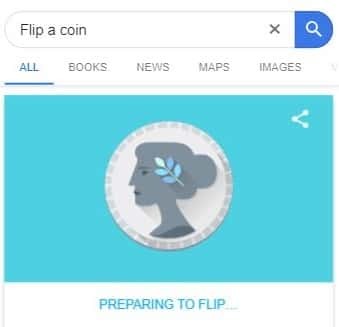 Now you don’t need to search for a coin to Toss during cricket, take your phone and ask Google to flip a coin. Need a Fidget spinner? Ask Google. 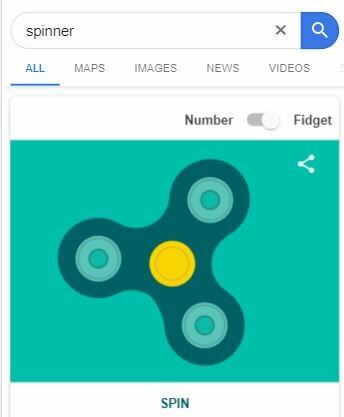 search for “spinner” in google and you’ll get a Fidget spinner. tap on the spinner to spin. You can also change the fidget spinner to a spinner wheel using the toggle button at the top right. 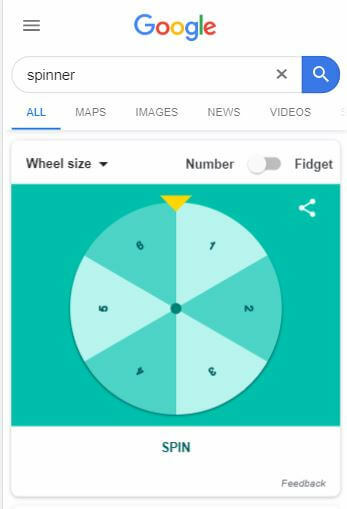 here you can change the number by changing the wheel size. 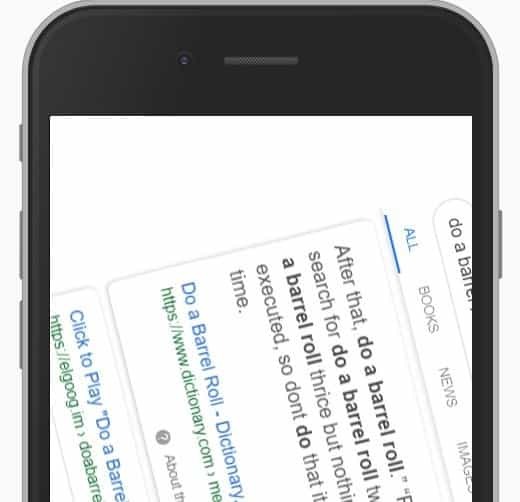 Yes, this will confuse you initially, stop thinking and Type “Do a barrel roll” in Google search and you’ll see the whole screen makes a 360° rotation. Feeling bored? Try ” I’m Feeling Curious” in Google Search, you’ll get some interesting questions with Answer. Now you don’t need to Download an Application for Mediation, Just Google “Breathing Exercise”. Done with “Do a barrel roll?” Okay, Type “Askew” but this time screen won’t rotate, It’ll do a tilt, as shown below. Are you a Designer? need to find Hexa codes of color? 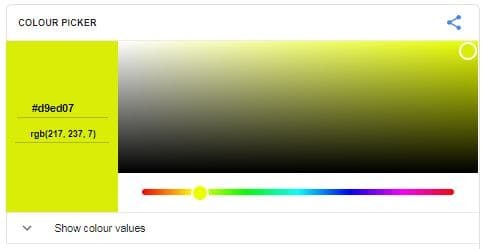 Just Google “Color Picker”, You’ll get a color picker window, Just pick the color you want and you’ll get the respective HEX, RGB, HSV, HSL, CMYK color codes. 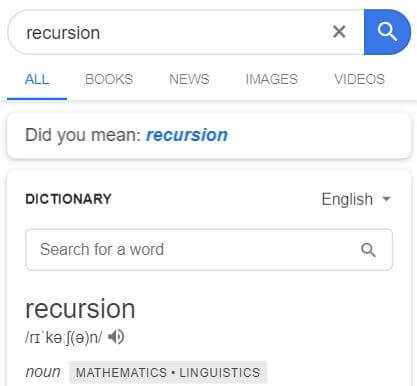 Typing “Recursion” in Google search will show you “Did you mean: Recursion” below the search bar even though you didn’t make any mistake in the spelling. funny way of explaining the meaning of this word. Just Google Search your math questions or type Calculator. 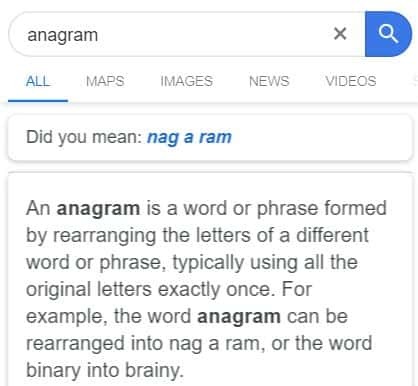 Just like “Recursion”, when you search for “Anagram”, Google will show “Did you mean nag a ram”. Anagram is a word or name or a phrase formed by rearranging the letters of another word. 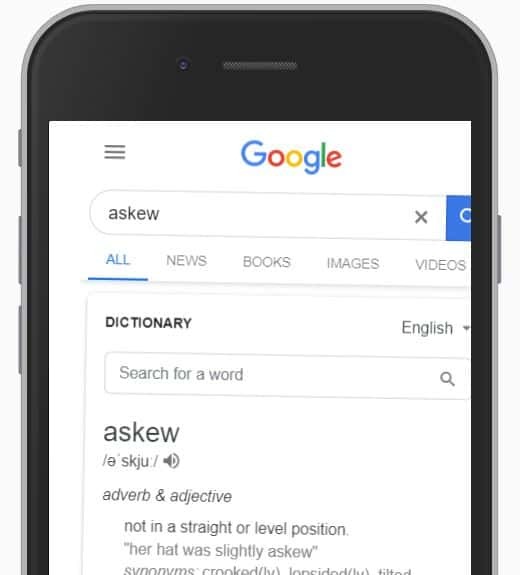 Just like “Recursion” Google shows fun in showing up the result for “Kerning” in the search result, Kerning is the process of adjusting the space in between the letters of a word. When you type “Kerning” in Google search, you can see a space in between each letter of the word K e r n i n g in the search result. 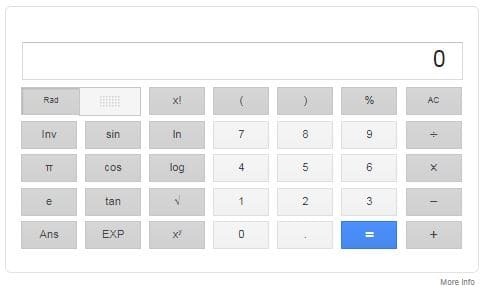 Search for “the loneliest number” in Google search and Google calculator will tell you the loneliest number. “Blink HTML” in Google search will make both of the words “blink” and “HTML” do just that “blink” wherever it appears in the search results page. This works only in Desktop. Do you want to know when is Once in a Blue moon? ask Google. 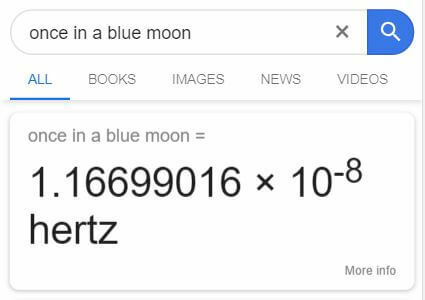 Google search: Once in a Blue moon. 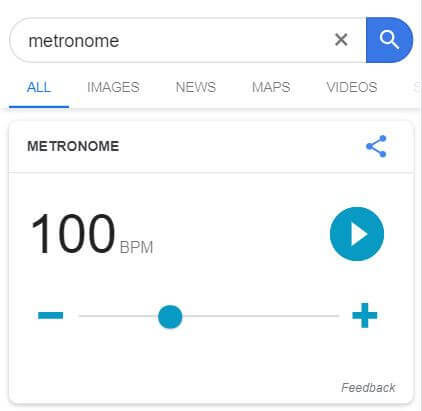 Metronome is a device which creates tik tik or some audible sound in regular intervals, usually, you can see this in hospitals, Google gives you the option to make the sound in Google search results. Adjust the BPM to change the sound and intervals. 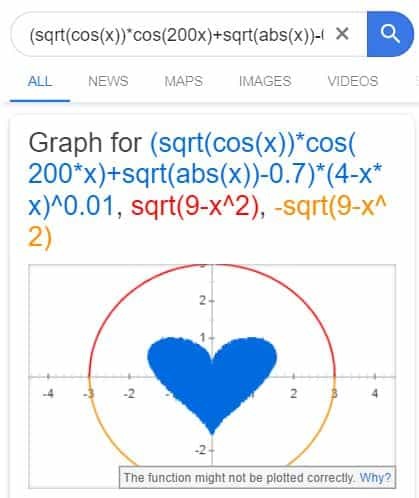 Draw a Heart in Google. You can send this to your love! Lol! Finally, the easter egg is here. Try this in Desktop and this won’t work in Mobile unless you enable Desktop site. 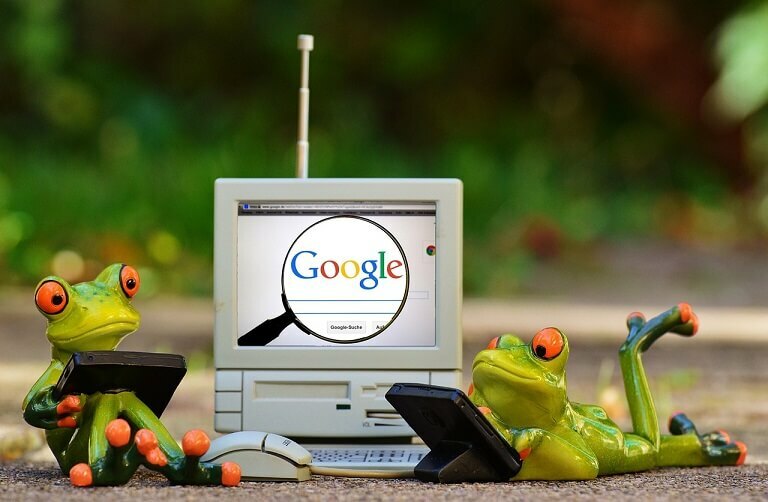 Still, there are much more Google search tricks hidden in Google, we will come back with an updated Google search post to give you much more awesome Google tricks. Please comment on the ones I missed. Wow, awesome tricks for Google search engine. The do a barrel roll is the best and it worked for me. 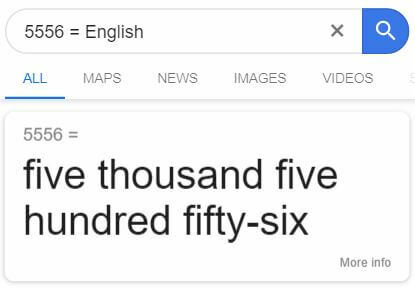 Thank you, Try other Google search tricks too. Great tips for those who use Google only for their research purposes where it is already best. Google can be a real fun place and can take care of much of your headaches if you know these tricks exist. Apart from these, Google tilt, earthquake, Google pac-man, and dinosaur game (an offline fun) can be a real mood busters. Try them out. Yes, I tried them already. those Google tricks are awesome.